Can the Nook stand up against the Kindle? 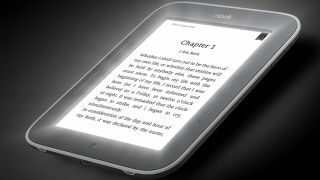 Barnes and Noble has confirmed that its Nook Simple Touch and Nook Simple Touch GlowLight e-readers will touch down in the UK. Both e-readers have already been out in the US for a while, but the American book retailer has now confirmed it's giving Britain some loving, with the release date pegged for October. The Nook Simple Touch sports a 6-inch E-Ink display, 800MHz single-core processor, Wi-Fi b/g/n, lightweight 212g frame, two month battery life, soft-touch case, 2GB internal storage and microSD card slot. You'll be able to pick the Simple Touch up for a paltry £79 when it launches in the coming weeks – putting it in direct competition with Amazon's £69 Kindle. Really taking the fight to Amazon is the Nook Simple Touch GlowLight. While the US is about to get treated to the Kindle Paperwhite, we won't be seeing the backlit e-reader this side of the pond – leaving the door wide open for Barnes and Noble to storm in and steal the show. The Simple Touch GlowLight packs a 6-inch touchscreen display, with the special GlowLight technology evenly illuminating the whole screen. As with the Simple Touch, the GlowLight comes with an 800MHz single-core processor, Wi-Fi b/g/n, 2GB internal storage and microSD card slot, and while it sports the same dimensions as its light-free brother, the GlowLight actually weighs less, tipping the scales at 197g. How much will the Nook Simple Touch GlowLight set you back? £109 – yep that's right, the same price as an Amazon Kindle Touch, which for the record, does not light up like a Christmas tree. Of course Amazon is already well established in the UK when it comes to e-readers and its vast library of books and other reading material makes the Kindle range an enticing offer. The Nook on the other hand is still trying to find its feet here in Blighty and Barnes and Noble will need to hit the advertising road hard to thrust their decent alternatives into the hands of the British public.